Today we’re going to be taking a close look at the ME MARTIAN ELITE Subea Easybreath full-face snorkel mask. It should come as no surprise that it’s one of our favorite snorkel masks available on the market today considering that it’s made by Decathlon, a company that is well known for their outdoor and sportswear. Their Subea brand (“SUBaquatic Experiences are Amazing”) is totally dedicated to underwater sports such as snorkeling, scuba diving, and spearfishing. With their years of experience in developing high-quality gear, it’s a given that the Easybreath is an incredibly solid snorkeling mask. Keep reading for our full review. Right off the bat, you can rest assured that you’re getting an exceptionally well-made mask designed by the company which invented the Easybreath Full-Face Snorkel Mask. Decathlon set out to design a snorkel mask that would appeal to snorkeling enthusiasts of all skill levels and they definitely succeeded. Full-face snorkel masks are great options for anyone who may have tried snorkeling before but was perhaps put off of the sport by using a mask that allowed too much water to get into the snorkel tube. They’re incredibly simple to use, allowing even novice snorkelers to simply put them on and immediately be able to enjoy a comfortable underwater breathing experience. As mentioned above, full-face snorkel masks are largely designed to make the entire snorkeling experience as easy as possible. It’s not at all uncommon for many people to have a bad experience using a traditional mask and snorkel set that leaves them with a sour taste in their mouth when it comes to snorkeling. Full-face snorkel masks are designed to allow for completely natural breathing through your nose or mouth when you’re in the water while using innovative dry-top technology to help keep saltwater out in case you’d like to dive down a bit deeper. Many people who have been put off by snorkeling before find themselves absolutely loving the experience when they try out a full face mask for the first time. When you purchase the Subea Easybreath full face snorkel mask, you’ll find the mask itself in the package along with an included GoPro attachment mount and a small mesh carrying bag to keep everything in. The Subea Easybreath snorkel mask features all of the usual bells and whistles that you would expect from a quality full-face mask. It offers a panoramic field of view with a full 180° effect. 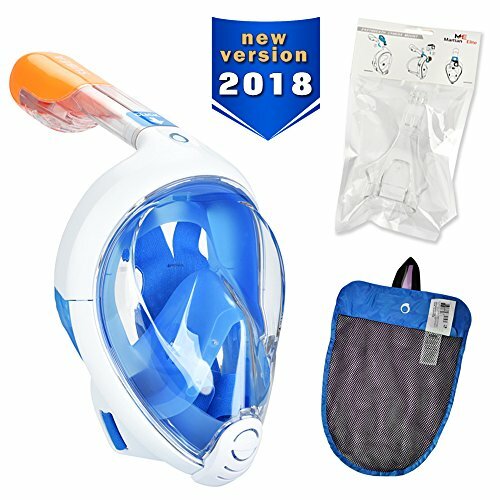 The full face mask allows for completely natural breathing and is also built with an exclusive air circulation concept that helps to prevent fog. In addition to that, a high quality silicone rubber skirt provides a comfortable fit that helps to seal water out. Meanwhile, the dry top snorkel system works to prevent water from getting into the mask by plugging the snorkel in case you decide to drop down below the surface a bit. There’s no denying that we’re huge fans of full face snorkel masks thanks to their fantastic ease of use, especially for novice snorkelers. However, it should also be noted that they’re not without their risks as well. While most full face snorkel masks are perfectly safe for surface snorkeling (up to depths of 10 meters), they should absolutely never be used for freediving beyond that as there’s a risk of CO2 buildup. With that in mind, it’s understandable if you don’t feel comfortable using a full-face mask. In that case, we can strongly recommend the Phantom Aquatics Panoramic Scuba Mask and Snorkel Set. It’s an extremely high-quality traditional mask and snorkel set that works phenomenally well for surface snorkeling. On the other hand, if you are indeed interested in a full face mask but you’d rather go with a more budget-friendly option, we would recommend the DasMeer Seaview Full Face Snorkel Mask. It’s about as high quality a full face mask for under $20 that you’ll find. Sometimes you can just tell when a company completely understands their target market. That’s definitely the case with Decathlon and the Subea Easybreath full face snorkel mask. The overall quality of this mask just shines through in every single area that counts. You’re getting an easy-to-use mask that offers an outstanding field of vision. It’s made with an anti-leak and anti-fog design that works great. And the dry-top snorkel on this mask is easily one of the better ones we’ve put to the test. All in all, there’s just a lot to like with this snorkel mask, including the fact that it’s reasonably priced when you consider its high quality design. All of these factors combine to make this one snorkel mask that’s an easy recommendation for hobbyists.